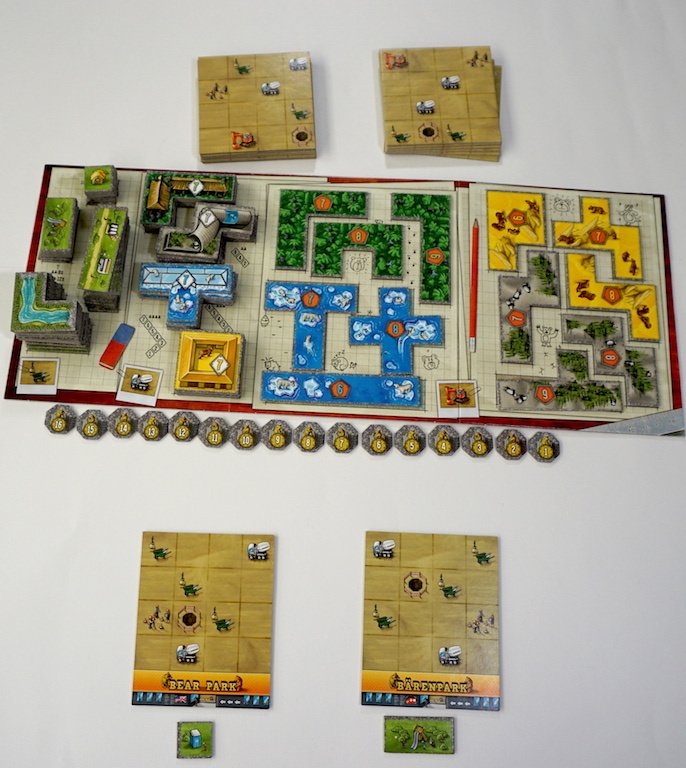 Lookout Spiele is the same board game development company that released Patchwork, the two-player quilting-themed tile laying game. Bärenpark is its spiritual successor. If you liked that game, read on! In Bärenpark, you are a bear park planner! Your goal is to select from the various bear tiles available to you to make the best park. You will expand your park beyond its original borders and optionally complete achievements that add to your point total. Whoever builds the best park, worth the most points, wins! When setting up Bärenpark, it is important to line up or stack the bear statues in order so the first statue taken is the highest point value. Similarly, stack the animal houses from highest to smallest point value. Pay attention to the rules! 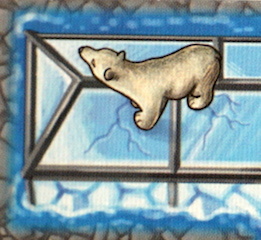 The number of tiles and bear statues placed on the supply board depends on the number of players. 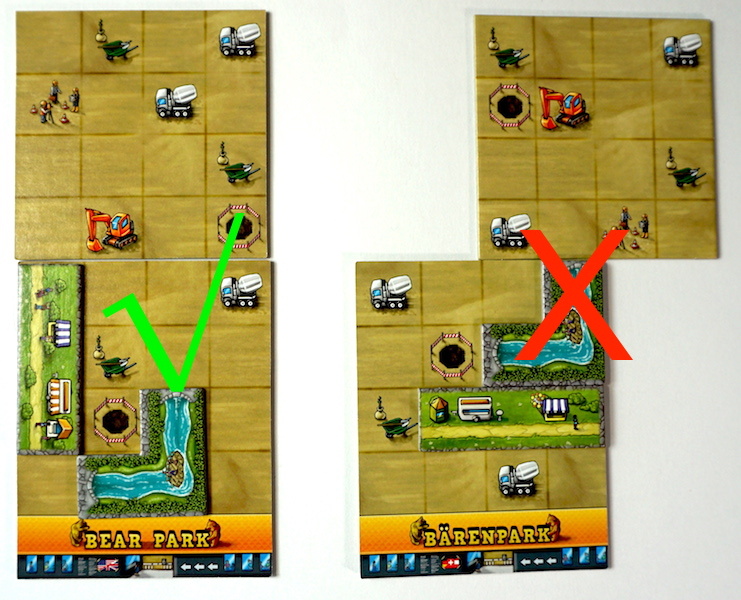 As with any excellent family game, Bärenpark has simple core mechanics. To begin play, each player has a starting park area in front of them. The starting areas are identical to the extension areas except they don’t contain an orange excavator icon and they include a park entrance. Each player gets a starting tile to place on their board when it is their turn. This tile is different depending on turn order (refer to rulebook). On each player’s turn they place a single tile from their inventory and draw a tile from the supply for each icon the placed tile covers. Tiles can never run off a board and can never overlap another tile. This process continues until someone fills their entire park up! Every tile has four construction icons on it plus a bear pit. The green wheelbarrow icons allow players to draw a tile from the wheelbarrow section of the supply board (green areas). The white cement truck icons allow players to draw from the animal houses section of the supply board. 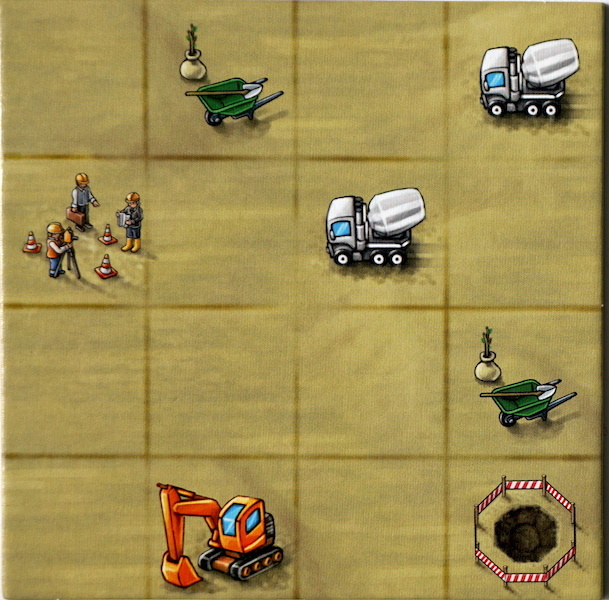 The orange excavator icon allows players to draw one of the specialty enclosure tiles. 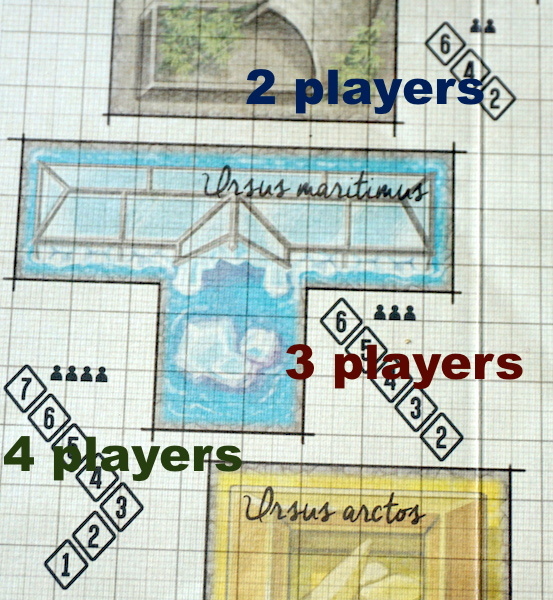 Finally, the icon of the surveyors allows the player to draw an expansion area for their park (up to three expansions). Each park expansion must be placed next to an existing park area and lined up completely. For example, if a player already expanded their park once, a second expansion cannot be connected across the two existing boards. Also, all icons must be in the same orientation, and none of the boards can be closer to you on the table than your start board. Players will eventually fill each of the park areas they have in front of them. Once a player fills every other square of a tile they fill the pit with the the highest value bear statue available. The game includes optional achievements to add to the challenge. These achievements focus on different aspects of the tiles: place three tiles with a certain bear type, place six connected green spaces, place one of each animal house, etc. These achievements are tiles just like everything else: The first person to get an achievement will get more points than the second person, etc. When a player fills their fourth park area (the start area and three expansions), each other player gets one final turn. When those turns end, players sum the points on their tiles and achievements. The player with the highest point total wins! Bärenpark is a smooth, streamlined gaming experience. Lookout Spiele knows how to create a great gaming experience without clutter and they’ve nailed it here. The optional addition of achievements adds depth to the game that can make the difference between victory and defeat. Despite the strategic nature of laying tiles to maximize points, our older children (6, 9) were able to pick up the game without difficulty. Our six-year-old has gone through multiple play sessions with joy despite losing (sometimes badly); a testament to the excellent play experience Mayfair provides. It’s also great that the achievements are optional; this simplifies the strategy a little bit which helps with our younger gamers. We aren’t huge fans of the art in Lookout Spiele games (Caverna, Agricola, etc). Bärenpark is no different. It does, however, feature some adorable little easter-egg type graphics scattered about the play pieces. We encourage you to find them! Ultimately, Bärenpark is a fantastic gaming experience. The worst thing we could say about the game is that the box insert is terrible. Just toss it and go with bags for the pieces. Nevertheless, whether the group is all adults, all children, or a mix, all players in all sessions had a great time. We were truly impressed at how balanced the game is, with many of our play sessions ending up with five points separating first and last (where the totals were near 100 points). With everyone so close together and the looks of disbelief on our faces, we’re sure it was a Kodiak moment. We have absolutely no doubt that Bärenpark is Gobi-ing to be a Hit! Mayfair Games provided The Family Gamers with a copy of Bärenpark for review. *Note: We realize Koalas aren’t technically bears. But Bärenpark uses them with the same disclaimer, so we’re keeping in line with them!